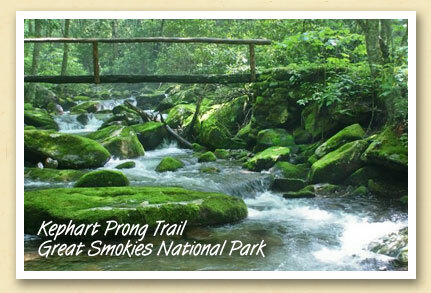 The Kephart Prong Trail (‘prong’ means a bend in the river) is a four-mile hike (in and out) that crosses the Oconaluftee River six times, with narrow footbridges provided at each crossing. The trail itself is an old road-bed with broken and exposed pavement at the beginning of the trail and eventually leads to a backcountry shelter. The trailhead is about seven miles north of the Oconaluftee Visitor Center on US 441. The hike is considered moderate with an elevation gain of 810 feet (2700 ft – 3510 ft).